Congenital dyserythropoietic anemia type II (CDAII), the most common form of CDA, is an autosomal recessive condition. CDAII diagnosis is based on invasive, expensive, and time consuming tests that are available only in specialized laboratories. The recent identification of SEC23B mutations as the cause of CDAII opens new possibilities for the molecular diagnosis of the disease. The aim of this study was to characterize molecular genomic SEC23B defects in 16 unrelated patients affected by CDAII and correlate the identified genetic alterations with SEC23B transcript and protein levels in erythroid precursors. SEC23B was sequenced in 16 patients, their relatives and 100 control participants. SEC23B transcript level were studied by quantitative PCR (qPCR) in peripheral erythroid precursors and lymphocytes from the patients and healthy control participants. Sec23B protein content was analyzed by immunoblotting in samples of erythroblast cells from CDAII patients and healthy controls. All of the investigated cases carried SEC23B mutations on both alleles, with the exception of two patients in which a single heterozygous mutation was found. We identified 15 different SEC23B mutations, of which four represent novel mutations: p.Gln214Stop, p.Thr485Ala, p.Val637Gly, and p.Ser727Phe. The CDAII patients exhibited a 40-60% decrease of SEC23B mRNA levels in erythroid precursors when compared with the corresponding cell type from healthy participants. The largest decrease was observed in compound heterozygote patients with missense/nonsense mutations. In three patients, Sec23B protein levels were evaluated in erythroid precursors and found to be strictly correlated with the reduction observed at the transcript level. 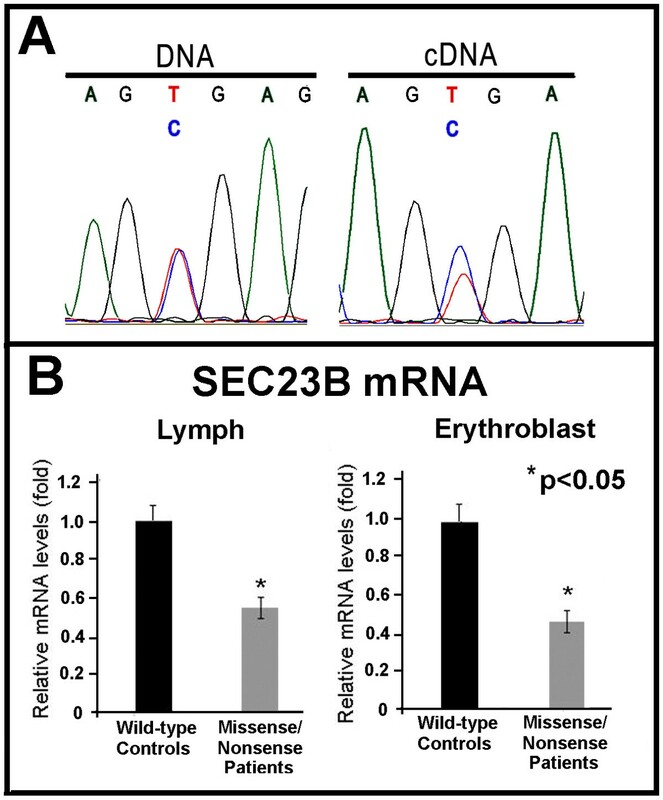 We also demonstrate that Sec23B mRNA expression levels in lymphocytes and erythroblasts are similar. In this study, we identified four novel SEC23B mutations associated with CDAII disease. We also demonstrate that the genetic alteration results in a significant decrease of SEC23B transcript in erythroid precursors. Similar down-regulation was observed in peripheral lymphocytes, suggesting that the use of these cells might be sufficient in the identification of Sec23B gene alterations. Finally, we demonstrate that decreased Sec23B protein levels in erythroid precursors correlate with down-regulation of the SEC23B mRNA transcript. Congenital dyserythropoietic anemias (CDAs) are a group of rare hereditary disorders characterized by ineffective erythropoiesis and distinct morphological abnormalities of the erythroblasts in the bone marrow . CDA type II (CDAII, OMIM 224100), which is transmitted as an autosomal recessive condition, is the most frequent; the main European Registries (German, Italian and French) have counted 367 patients . The clinical picture is characterized by mild to moderate anemia associated with jaundice, splenomegaly, and iron overload [3, 4]. In clinical practice, evidence of CDAII is primarily based on bone marrow examination [5, 6]. Confirmation of diagnosis is based on at least one of the following biochemical tests, including: a positive acid serum lysis test with ABO-compatible sera; band 3 protein glycosylation defects evidenced by sodium dodecyl sulphate-polyacrylamide gel electrophoresis (SDS-PAGE); a discontinuous double membrane in mature erythroblasts (visible by electron microscopy), and the presence of endoplasmic reticulum (ER)-specific proteins [5, 7–9]. However, these tests are expensive, time consuming, and often available in only a few specialized laboratories. For these reasons, the correct diagnosis of CDAII is often delayed or erroneously suspected. A major breakthrough in CDAII research was achieved in 2009, when Schwarz et al. and Bianchi et al. found mutations of the SEC23B gene in patients with CDAII [10, 11]. Sec23B protein is an essential component of coat protein complex II (COPII), coated vesicles that transport secretory proteins from the ER to the Golgi complex . So far, SEC23B changes have been identified mainly by direct genomic sequencing of the coding region of the gene [10, 11, 13–15]; however, the precise effects of the described mutations on the RNA expression level in erythroid cells has not been studied. Moreover, a reduction of Sec23B protein in CDAII erythroid precursors has not been reported. In this study, we investigated SEC23B gene mutations, by both genomic and cDNA direct sequencing, in 16 unrelated Italian CDAII patients from 16 families. In all cases, we identified SEC23B mutations, and four of these were novel. We also evaluated the effects of different SEC23B mutations on mRNA and protein expression levels. We collected blood samples from 16 unrelated Italian CDAII patients belonging to 16 families and 100 unrelated Italian controls (included in the DNA sequence analyses). The diagnosis of CDAII was made on the basis of clinical features, bone marrow examination, and/or SDS-PAGE. All patients provided their written informed consent for the study, which was approved by the research ethics committee of the Second University of Naples, Italy. The study was conducted in accordance with the Declaration of Helsinki. After informed consent had been obtained, peripheral blood from CDA II patients and from 5 healthy control relatives was collected into sterile heparinised tubes. Light-density mononuclear cells obtained by centrifugation on Lymphoprep (Nycomed Pharma) density gradient were enriched for CD34+ cells by positive selection using CD34 microbeads (Miltenyi Biotech) according to the manufacturers' instructions. CD34+ cells were cultured at a density of 105 cells/mL in alpha-minimal essential medium (α-MEM; GIBCO) supplemented with 30% fetal bovine serum (FBS; GIBCO), as previously described . To induce cells proliferation and erythroid differentiation, cells were cultured with 20 ng/mL rH stem cell factor (SCF, PeproTech), 10 ng/mL rH interleukin-3 (IL-3, PeproTech) and 3 U/mL recombinant human (rH) erythropoietin (rHuepo, Janssen-Cilag). Cells were incubated at 37°C with an atmosphere of 5% CO2 for 14 days; after 7 days of culture the medium was changed to ensure good cells feeding. Cell samples were collected on days 14 of culture (mature erythroblast stage) for further analysis. Genomic DNA was isolated using the Flexigene DNA extraction kit (Qiagen). All SEC23B exons, their flanking splice junctions, and their 5'- and 3'-untranslated regions were amplified with 21 polymerase chain reactions (PCRs). cDNA was prepared, using the iScript cDNA synthesis kit (Bio-Rad), from approximately 100 ng mRNA obtained from lymphocytes (Trizol Reagent Kit - Invitrogen) from all 16 patients and 8 healthy control relatives. cDNA was obtained also from erythroblasts  from 8 patients (ID: F1, G2, B3, A4, C5, B11P13, and M15) and 5 of the 8 healthy control relatives mentioned above. The coding region of the SEC23B cDNA was covered by six PCR fragments. Sequences of all primers can be found in Table 1. The PCR conditions were: 94°C for 5 min; 30 cycles of 94°C for 30 sec, 58°C for 30 sec and 72°C for 30 sec; and 72°C for 7 min. Amplified DNA and cDNA were purified (Exo-Sap-IT) and sequenced using BDT v3.1 on an ABIPrism 3130XL genetic analyzer. Sequences were analyzed using the SeqScape program, version 2.6 (Applied Biosystems). cDNA was prepared from patients' mRNA from lymphocytes and erythroblasts. Real-time PCR was performed in accordance with manufacturers' instructions. The reactions were run on an ABI 7300 real-time PCR system (Applied Biosystems); the cycling conditions were 10 min at 95°C (initial denaturation) followed by 40 cycles of 15 sec at 94°C (denaturation) and 1 min at 68°C (annealing/extension/data collection). In the first step, we determined the stability of a control gene (β-actin) for the normalization of the real-time PCR products. The linearity and efficiency of this assay were tested over dilutions of input cDNA spanning five orders of magnitude. Assays were performed in triplicate. We used the 2-ΔΔCt method to analyze the data obtained. Proteins were extracted from erythroid cultures of patients A4, B3, and C5 using RIPA Lysis Buffer (Millipore) and following the manufacturer's instructions. Sec23B was characterized in total lysates from erythroid cultures by Western blotting. Membranes were incubated overnight at 4°C with rabbit polyclonal anti-Sec23B antibody (1:500 dilution; SAB2102104, Sigma-Aldrich); reactive bands were detected by chemiluminescence (SuperSignal). An anti-β-actin antibody (1:500 dilution; Sigma) was used to check for comparable protein loading and as a housekeeping protein. Images were captured, stored, and analyzed using Quantity One software (BioRad). We identified SEC23B mutations in all 16 patients enrolled in the study. Among the 15 mutations characterized, four are novel: c.640C > T, c.1453A > G, c.1910T > G, and c.2180C > T (Table 2). In total, we identified 10 missense, three nonsense, one in-frame deletion of 3 nucleotides, and one splice-site mutation. The splice-site alteration creates a new donor site after exon 2 of the SEC23B gene. Most of the investigated patients were compound heterozygotes. Only four patients had homozygous SEC23B mutations; three of these were homozygotes for the c.325G > A variant that leads to the amino acid change p.Glu109Lys (the most frequent SEC23B mutation encountered, with a prevalence of 32% among CDAII patients). The fourth patient was homozygous for the c.1254T > G mutation (p.Ile418Met). In two patients, we observed only a single heterozygous mutation (Table 2). Because individuals with a heterozygous SEC23B mutation are not affected by CDAII, we investigated in detail the putative occurrence of heterozygous exon deletions/insertions in the alternative allele in these patients. PCR of cDNA using primers located in the 5' and 3' untranslated regions of the gene revealed full-length transcript in both patients and no aberrant products, excluding the presence of heterozygous exon deletions/insertions. cDNA sequence analysis confirmed the heterozygous missense mutation and the presence of two alleles (i.e., wild-type and mutant). We also sequenced SEC23B cDNA from the 16 CDAII patients. In all cases, the mutations identified by genomic analysis were confirmed by cDNA sequencing. Even in the patients carrying nonsense mutations (which most likely lead to RNA decay), it was possible to visualize the genetic change by cDNA sequencing (Figure 1A). None of the novel mutations described in this study was found in 100 unrelated Italian controls. All mutations were absent from the 1094 individuals from the 1000Genomes project. A) Electropherogram depicting the nonsense mutation (c.367C > T) observed after DNA and cDNA sequencing; B) Relative SEC23B mRNA expression levels in lymphocytes and erythroblasts from patients with nonsense/missense mutations compared with healthy controls. To directly evaluate the consequences of the genomic SEC23B mutations, we investigated SEC23B mRNA levels in patients and healthy individuals using quantitative PCR (qPCR). Patients that were compound heterozygotes for a missense and a nonsense mutation exhibited a drastic decrease in mRNA expression levels of approximately 50-60% when normalized to the endogenous control gene β-actin (Table 2 and Figure 1B). Patients with two missense mutations showed a milder reduction in SEC23B mRNA levels (approximately 40-45%) (Table 2). The results were similar when using RNA from lymphocytes or mature erythroblasts (Figure 1B and data not shown). The two patients with a single heterozygous mutation on SEC23B (C9 and P17) also exhibited a reduction of SEC23B transcript (Table 2). Patient A4 was compound heterozygote for a splicing mutation (c.221+31A > G) and a nonsense change (c.367C > T). In this individual, we suspected very low or no wild-type (WT) transcript. Therefore, we investigated A4 SEC23B mRNA more in detail. 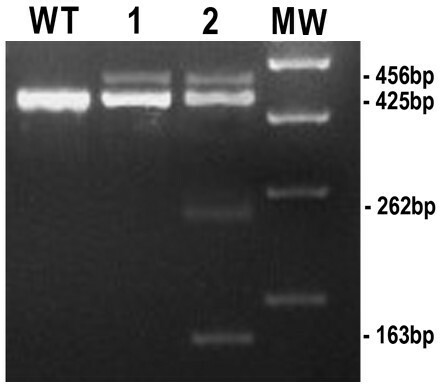 First, the presence of the +31A > G allele was confirmed on agarose gel by the presence of an additional 31-bp band. In the other allele, the nonsense mutation creates a restriction site for the enzyme HpyCH4III. After enzymatic digestion of the PCR product with HpyCH4III restriction enzyme, we observed four fragments: an upper band for the + 31A < G allele, two lower bands representing the cut allele carrying the nonsense mutation, and a normal-sized band (Figure 2). The occurrence of a normal transcript indicates that at least a small amount of WT SEC23B RNA is present. This finding corresponds to the observed 35-40% SEC23B mRNA expression level measured by qPCR. Characterization of SEC23B mutations in patient A4. Lymphocytic cDNA was amplified using primers localized in exons 1 and 4 (A4-SEC23B-1F: TTGTACCCCTGGCTTGTCTC and A4-SEC23B-4R: ATGAACCTGCACCATCCTTC). The control shows the 425-bp product (wild-type, W.T. ); (1) Patient A4: Two bands (456-bp and 425-bp) were present. The additional 456-bp band is due to the splicing mutation: c.221+31 A > G; (2) The nonsense mutation (c.367 C > T) creates a restriction site for the enzyme HpyCH4III. SEC23B PCR product from patient A4 was enzymatically digested. The two resulting bands (262-bp and 163-bp) represent the cut allele carrying the nonsense mutation. M.W. = Molecular Weight. Finally, we investigated the amount of Sec23B protein in the erythroblasts of 3 CDAII patients (C5, B3 and A4) by immunoblotting. The Sec23B content was normalized to β-actin. As depicted in Figure 3A, the Sec23B content of patients C5 and B3 was clearly reduced compared to two different controls. Similar results were obtained in two independent experiments. Moreover, the estimated Sec23B protein level in erythroblasts from patient A4 suggested that it corresponded to approximately 30-35% of that of a healthy individual (Figure 3B). Therefore, our data suggest good correspondence between the transcript amount and protein content, underscoring the usefulness of mRNA evaluation. Sec23B protein analysis in erythroid precursors. 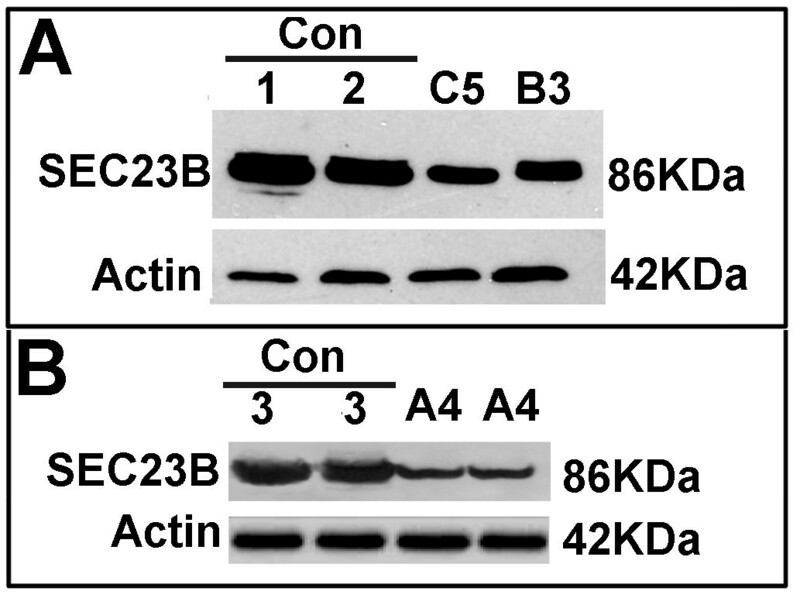 Western blots from patients C5 and B3 (panel A), and A4 (panel B) demonstrate reduced Sec23B expression compared with control participants (Con). Approximately 40 μg of protein were loaded. β-actin was used as a loading control. The experiment was representative of two different experiments. In this study, we identified four novel SEC23B gene mutations by analyzing 16 Italian patients with CDAII (Table 2). We also identified two CDAII patients with only one heterozygous mutation each. Since the initial identification of SEC23B mutations in CDAII patients, 59 mutations have been identified, including the current work (Table 3) [10, 11, 13–15, 17, 18]. Two missense mutations have been repeatedly identified in a large proportion of patients: p.Glu109Lys and p.Arg14Trp (32% and 19%, respectively). To date, these missense mutations account for approximately 50% of the mutant alleles in CDAII patients (Table 3). Notably, evidence of a founder effect has been described for p.Glu109Lys among Israeli Moroccan Jewish patients . Concerning mutation type, missense (52%) and nonsense (21%) mutations are the most commonly observed followed by deletions or insertions that lead to frameshifts in the nucleotide sequence. Splicing mutations are rare, with only six mutations reported (Table 3). The SEC23B gene appears to play a pivotal and probably unique function in erythroid precursors [19, 20]. Although detailed genetic analyses have been conducted, the effects of the mutations on mRNA content in erythroblast cells have not been documented. Moreover, no data are available about the effects of mutations on Sec23B protein content in red cell precursors. To evaluate the effect of missense and nonsense mutations on SEC23B mRNA expression levels, we performed quantitative (qPCR) analysis of SEC23B transcripts on all of our patients. In this study, we used both cDNAs prepared from erythroid precursor cultures and peripheral lymphocytes. Although we demonstrate that all patients have a significant reduction of SEC23B mRNA, this reduction was more pronounced in patients with missense/nonsense mutations (Table 2) . From a diagnostic point of view, it is interesting to note that the results obtained in erythroid precursors and lymphocytes were comparable, suggesting that peripheral lymphocytes not only represent a good source of SEC23B transcript, but also replicate the effect of the genetic change observable in the erythroid population. In addition, to search for genotype-phenotype correlation, we grouped patients according to their degree of anemia. We did not observe any correlation between degree of anemia, type of mutation, and relative SEC23B mRNA reduction (data not shown). Almost all CDAII patients harbor mutations in both SEC23B alleles. In a few cases (10 out of 111 described in the literature, or 9%), only a single heterozygous SEC23B mutation has been found. This finding raises the possibility of the occurrence of mutations that have thus far escaped the exon screening technology. In our study, two CDAII patients were identified in whom a mutation was observed in only one allele. In these participants, mRNA analysis (cDNA sequencing and long-range PCR on cDNA) confirmed the presence of both wild-type and mutated alleles. However, qPCR analysis revealed a reduction in SEC23B mRNA expression of approximately 40% in these patients compared with control participants, similar to the reduction observed in patients with two missense mutations. This finding suggests the possible occurrence of mutations that affect the regulatory regions of the SEC23B gene. Alternate mechanisms such as microRNA dysregulation could be responsible for CDAII in these cases where the second heterozygote mutation has not been found. Here we demonstrate that SEC23B mutations result in reductions of both the relative transcript and protein content in erythoid precursors. So far, only one study has investigated protein levels of Sec23B in CDAII patients . No reduction of Sec23B protein levels was observed, most likely due to the type of cell used in the study (fibroblasts). Our data, although comprising a small number of cases, clearly demonstrate that CDAII erythroblastoid cells show a strong reduction of the protein that parallels the data regarding mRNA levels. Future investigations are necessary to clarify the effect of protein reduction on the patients' phenotype. Patients lacking Sec23B expression have never been described. We identified a single patient (A4) with a nonsense mutation and a splice site mutation (c.221+31 A > G) that causes a stop codon after exon 1. In our view, this patient could have had a very strong reduction of Sec23B expression. On the basis of this hypothesis, we analyzed the amount of SEC23B mRNA and protein in this patient in detail. The results demonstrate that there is still a small amount of WT SEC23B mRNA and that the Sec23B protein level in this patient corresponds to 30% of the level observed in healthy participants, suggesting that the absence of SEC23B expression may be lethal. This study reports SEC23B gene mutations in all 16 CDAII patients studied, confirming the causative relevance of the gene to the condition. We also demonstrated that the SEC23B gene mutations lead to a remarkable reduction of SEC23B transcript in erythroid precursors, the cell type altered in the disease. We also demonstrated that quantifying and sequencing SEC23B mRNA from peripheral lymphocytes (and not only from erythroid cultures) might facilitate the genetic diagnosis of CDAII. Our data on heterozygote patients suggest (although indirectly) the occurrence of rare mutations is not restricted to its coding regions. Finally, we demonstrate that the relative mRNA reduction directly corresponds to a protein decrease in erythroblastoid cells. Future studies will be devoted to characterizing the effect of SEC23B protein down-regulation on erythropoiesis and clarifying SEC23B gene regulation. The authors thank all patients and their family members for their participation in the study, and Emanuela Punzo for assistance with the figures. This work was partly supported by grants from "Progetti di Rilevante Interesse Nazionale"(PRIN), Regione Campania (L.R. 5/02, 2005), the "Francesco Fede" Department of the Second University of Naples (Grant on Normal and Pathological Hematopoiesis), and the Centre for Biomedical Genetics, the Netherlands. FP wrote the paper, performed the experiments, and analyzed data. AMB-A. contributed to the writing of the paper and study design. SS performed experiments and analyzed data. MC contributed to patient selection and clinical characterization. LR and MDC produced erythroid precursor cell lines. GLF and AI contributed to patient selection and clinical characterization. BAO and FDR contributed to study design. SP designed the research study, selected patients, and contributed to the writing of the paper. All authors read and approved the final manuscript.